1. Preheat the oven to 220c (200 fan), 425f, gas mark 7. Line a roasting tin with kitchen foil that’s large enough to cover the pork. Place the pork in the tin, rub the salt & 1 tsp of the paprika into the pork & cook without covering for 30 minutes. 2. Reduce the oven temperature to 150c (130 fan), 300f, gas mark 2. Rub the pork with the remaining paprika & the sugar & mustard. Loosely cover with foil. Cook for a further 3 hours. 3. Increase the oven temperature to 220c (200 fan), 425f & gas mark 7. Cook the uncovered pork for a further 20 minutes. Then remove from the oven & set aside to rest for 30 minutes. 4. Pull the pork into pieces with two forks. Pour any cooking juices & the stock over the shredded pork. Stir to combine. 5. 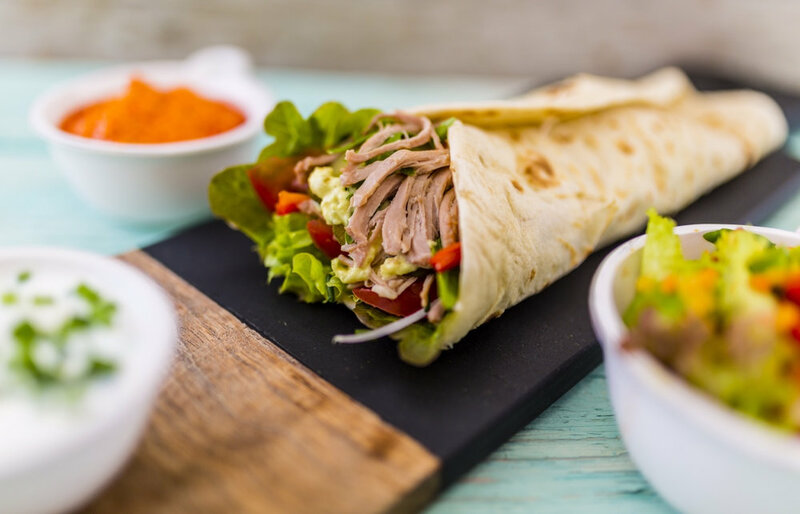 Weigh out 400g of pulled pork per wrap & put the wraps together using the pork & the remaining salad ingredients, juice & dipping sauce. 6. Can be prepared in advance for packed lunches.